Arguably the most anticipated landmark Vancouver downtown condo high-rise in the past few years, the new TELUS GARDEN Vancouver condo tower is starting pre-VIP sales right now! Get on our VIP LIST by registering for the preconstruction Vancouver TELUS GARDEN condos that will be developed at Richards and Robson Street Vancouver Downtown real estate district. 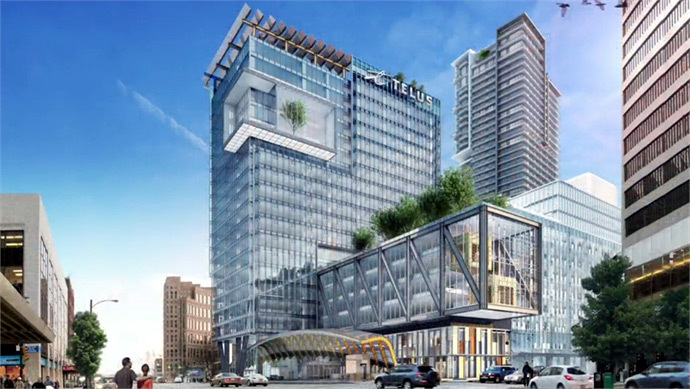 Featuring a collaboration between notable companies based in Vancouver, the new TELUS GARDEN condo high-rise will be jointly developed and funded by Westbank Developers as well as TELUS, the Canadian telecom conglomerate. The amenity rich and environmentally friendly TELUS GARDEN Vancouver condos for sale will include the addition of approximately 430 new condominium residences at the corner of Richards and Robson Street where you will find one of the largest master planned downtown Vancouver real estate developments in recent history. Here, the 53 storey high-rise will feature a 450k square foot residential landmark Vancouver tower in addition to over 500k square feet of office space in a separate 24 storey high-rise. There will be a 3 level podium the preconstruction Vancouver TELUS GARDEN condo development which will be home to retail stores, boutique shops, services, restaurants, cafes, other amenities and even a beautifully designed public plaza and thoroughfare for pedestrian traffic. In addition to Westbank Developers and TELUS, the new landmark Vancouver TELUS GARDEN Condos for sale will also introduce Henriquez Partners Architects for the design and unique architecture of this modern glass tower that will provide the iconic statement for the downtown skyline for decades to come. At 53 stories in height, the new TELUS GARDEN Vancovuer downtown condo tower will be the 3rd tallest high-rise in the city and will revitalize this Richards and Robson Street corridor to become the most exciting community for residents as well as businesses. For more information, please VIP REGISTER for the BEST SELECTION OF SUITES & PRICING at Telus Garden Vancouver Condos for sale. The new TELUS GARDEN Vancouver condo project will include 1 to 3 bedroom homes in addition to luxury Vancouver TELUS GARDEN Penthouse Suites and Sub-Penthouse Residences as well as the Telus Garden Signature Suites for sale starting from the $270,000’s range. Remember that the new BC HST transitional rules will apply in addition to the new Home Buyers Rebate so that these units are ultra affordable for the downtown Vancouver real estate market. Also the project is striving for LEED Platinum and Gold certification, which means that the buildings will use approximately 80% less energy than a standard high-rise building! Some of the interior highlights at Telus Garden Vancouver downtown real estate development includes high-end finishes with natural stone thrsholds at the entrance of the units as well as bamboo wood floors throughout the main living areas. Also, the preconstruction Vancouver Telus Garden condos for sale will introduce one hundred per cent wool carpets in the bedrooms that are low maintenance and very durable. All of the floor plans will be open concept and most of the suites will have outdoor living spaces. There are also custom designed entertainment units in select suites. 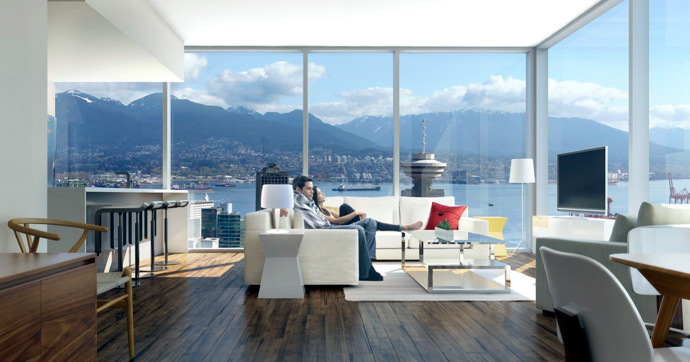 All Telus Garden condos in Vancouver Downtown will also come with window shades for privacy. The bathrooms at the new Vancouver Telus Garden apartments for sale will include Kohler Persuade high efficiency dual flush toilets in addition to separate glass enclosed showers for the ensuites (with Kohler products and rain shower head). Other bath features at the Telus Garden Apartments in Vancouver include Kohler under cabinetry basins, polished stone vanity counters and custom bathroom vanities and cabinets with soft closing mechanisms. The new Vancouver Telus Garden apartments for sale will also have modern drop in tubs with tiled surrounds, sleek modern fixtures, medicine cabinetry, vessel sinks and vanity lighting that is custom designed and selected for your suite. Also, there are luxurious stone tiled floors and tub surrounds. The kitchens at Telus Garden Vancouver downtown condos for sale will include a full set of Miele stainless steel appliances including a fridge with bottom freezer, fully integrated dish washer, oven with true convection, baking and auto roast features in addition to a four burner gas cook top. Also, all homes at the Telus Garden Vancouver downtown condos for sale will have Miele front laoding washer and a ventless electric dryer in laundry closets. The kitchens at the downtown Vancouver Telus Garden Condos for sale will introduce open ended integrated bookshelves in select units, dual depth upper cabinetry, sleek faucets, modern stainless steel sinks and either Icestone slab or polished quartz countertops which are healthier and more expensive than traditional granites. The new Vancouver Telus Garden condos will also have contemporary designed cabinets, soft closing mechanisms for all cabinetry doors and drawers and built in LED lighting. One of the great perks of purchasing a new home at Telus Gardens in Downtown Vancouver real estate market is that it is built jointly between Westbank and TELUS itself. With that in mind, all of the Telus Garden Vancouver condominiums are TELUS Future Friendly Homes. Telus Garden VAncovuer condominiums is a breath of fresh air according to their online marketing. Every TELUS Future Friendly Home comes equipped with the best in entertainment, offering a full range of high-end TELUS services, all included in the monthly strata maintenance fee. Therefore, if this is your primary residence or an investment, the Telus Garden Vancouver condominiums is a step above the rest of the competition in the downtown Vancouver real estate market because of the integrated TELUS Future Friendly Home package. The TELUS Optik TV is part of the package at the new Vancouver TELUS Gardens where you will get the best in digital television, shows and features with a recording PVR for your favourite shows and sports events. In addition, the TELUS Garden future friendly homes will also include Opitk Internet, which is high-speed, dependable and ultimately included in your strata fees. There is the Telus Phone, Telus Garden App and the climate and energy controls that new homebuyers want these days too. With this in mind, home owners at the new Telus Garden Vancouver condominiums can easily control the heating and cooling system to maximize their energy efficiency and to reduce their ongoing costs. The estimated maintenance strata fees at TELUS GARDEN Vancouver downtown condos for sale is approximately $0.48 per square foot, which is very reasonable for the amenities on site. The TELUS GARDEN strata fees include: 24 hour concierge, access to amenity spaces, TELUS Future Friendly Home package. There are many Telus Garden floor plans to choose from, but they are mainly split into 4 categories as follows. On Levels 7 – 21 of the landmark Vancouver downtown condo tower, the Telus Garden floor plans include 1 bed to 2 bedroom residences that range from 467 sqft (1 bed) to 1,131 sf (2 bed). The floor plate for Levels 7 – 21 at the downtown Vancouver Telus Garden high-rise includes 12 suites per floor. Floors 26 to 30 will feature similar Vancouver Telus Garden floor plans that include 1 bedroom suites from 490 square feet facing west to the large 3 bedroom suites at 1,165 to 1,173 square feet depending on the floor. There are also several 2 bedroom floorplans available on these levels. The floorplate for Floors 26 to 30 will include 12 suites per floor with 12 different downtown Vancouver Telus Garden floorplans for home buyers to choose from. 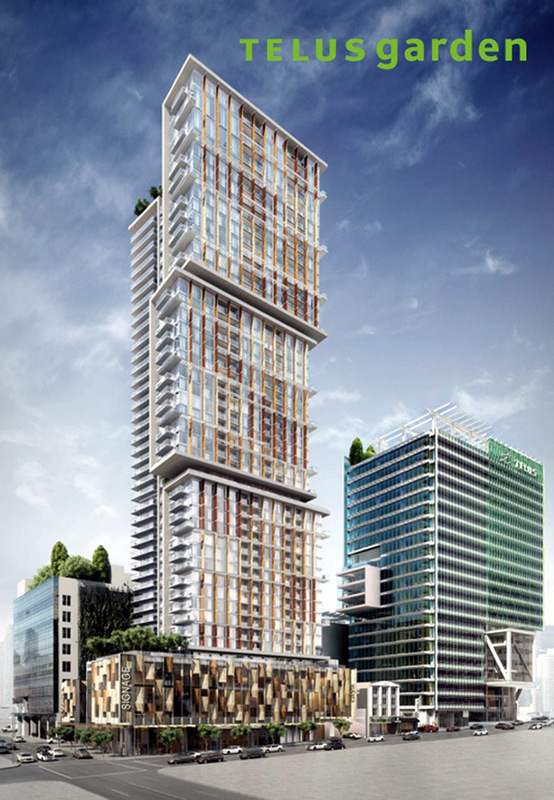 Again, the landmark Vancouver condo tower at TELUS Garden will feature a 53 storey high-rise with 428 homes for sale. The Telus Garden Signature Suites and Telus Garden Penthouse floor plans have not yet been released for previewing. Please VIP REGISTER to get a hold of these floorplans as soon as they are released by the developer and sales team. Did you know that the spectacular Telus Garden amenities includes a welcoming entrance lobby with a multi media art wall? Also, there is a 24 hour concierge desk as well as added security with a video enterphone and key fob access. The architecture of this amazing landmark Vancouver condo tower is designed by Henriquez Partners Architects and the landscape architecture firm is by Phillips Farevaag Smallenberg with the heavy use of west coast glass, wood, sonte and native plants. The downtown Vancouver Telus Garden condos are also pet friendly with a dog park amenity space on site with pebbles, concrete, stone, grass and wood for your fury friends. Also, there is a heated outdoor lap pool with an outdoor terrace for home owners to relax, exercise and enjoy the incredible views. The downtown Vancouver Telus Garden amenities also includes a green roof, lush panters and a Wellness Centre with full gym and a YYoga studio. The Telus Garden amenities also includes a contemporary lounge with gas fire place, lounge area, and even a café and refreshment bar. PLEASE VIP REGISTER for the best selection of suites and pricing during the presales event!